The northern part of Mesaieed sabkha in Qatar. Frequent saltwater incursions make this area inhospitable, but certain microbes thrive in those conditions, creating extensive microbial mats that gradually turn into calcite and dolomite rock. During dry periods, the mat hardens, and the surface cracks and bows to form saucerlike polygons. Credit: E. Perri et al. (2017), Carbonate and silicate biomineralization in a hypersaline microbial mat (Mesaieed sabkha, Qatar): Roles of bacteria, extracellular polymeric substances and viruses, Sedimentology, doi:10.1111/sed.12419, Figure 1b. © 2017 The Authors. Sedimentology © 2017 International Association of Sedimentologists. Published by Wiley. To get a feel for what life on Earth was like in the very beginning, you only have to go to the coast of Qatar, to a salt flat called Mesaieed sabkha, and step on the black sludge you’ll find there. Bacteria have built up this sludge over thousands of years. The top layers grow thanks to sunlight, whereas in lower, older layers, biomass and trapped sand slowly change into a sedimentary carbonate rock called a microbialite. The way that this hardening, or lithification, happens is of great interest to biologists who want to know how life was lived in its earliest manifestations and to geologists looking for new oil reserves, according to geologist Maurice Tucker of the University of Bristol in the United Kingdom. Tucker presented new findings about the Mesaieed sabkha this past fall at the International Meeting of Sedimentology in Toulouse, France. The research, which was subsequently published in the journal Sedimentology, has yielded new clues about what’s going on in the sludge, more formally known as a microbial mat, and the rock that it becomes, he said. In addition to the sludge’s bacterial denizens, Tucker maintains, scientists must take into account another life-form: viruses. In recent years it has been proposed that these organisms, instead of just preying on the bacteria in the mats, are actually crucial elements in the mats’ lithification, he noted. Given that microbial mats produced some of the earliest known fossils, establishing the role of viruses in existing mats may also help scientists to find out when viruses first appeared on Earth, which is still a matter of much debate. Microbial mats were the earliest macroscopic manifestation of life. They were ubiquitous 3.5 billion years ago when there were simply no other creatures to eat or disturb them. In Qatar, your foot wouldn’t go down very deep because the mat is just 10 to 20 centimeters thick. Still, that thickness represents about 6,000 years of growth, which started when the sea level rose and regular flooding of the sabkha began. At different depths in the mat, different species of bacteria thrive, but all are surrounded by a fluid consisting of excreta and remains of dead bacteria called extracellular polymeric substances (EPS). That fluid is where the lithification of the mat takes place. The ultimate driver of the transformation is sunlight. “The bacteria in the top layer of the mat are photosynthesizing,” Tucker explained. “Because they take carbon dioxide and release oxygen, they produce bicarbonate.” The bicarbonate reacts with calcium and magnesium in the EPS (which come from the seawater) to form crystallites, very small crystalline grains, of calcite (calcium carbonate) or dolomite (calcium magnesium carbonate). The formation of the first crystallites is a crucial step of lithification. However, at the concentrations of the chemical ingredients found in the Mesaieed sabkha, crystallites wouldn’t take shape frequently or rapidly enough to transform a mat into stone, according to Tucker. Some sort of seed is needed to nucleate crystallites in abundance. He and other microbial mat researchers wonder if viruses might play that role. One reason to look at viruses is their extreme abundance in microbial mats. Using a new method, Cátia Carreira of the Royal Netherlands Institute for Sea Research concluded in a 2015 paper in Applied and Environmental Microbiology that microbial mats contain up to 28 billion viruses per gram of mat material: 1 to 3 orders of magnitude greater than the concentration elsewhere on sea bottoms. Another reason is that viruses are the right size: most are from 20 to 300 nanometers in diameter. However, viruses in their natural state don’t have the correct chemical composition to act as seeds. “There are a lot of bits and pieces in the sea, but often, they are bits of organic matter. It’s got to be calcium or magnesium” for those bits to act as seeds for carbonate crystallites, Tucker said. 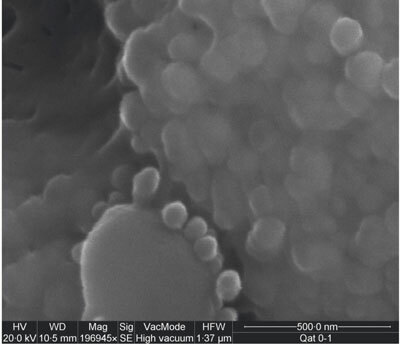 What’s new in the images are objects that look like viruses caked with calcium or magnesium minerals. At the conference and in their 7 December 2017 Sedimentology paper, Tucker and his colleagues presented microscope images from within the Mesaieed sabkha mat. These images have better resolution and clarity than previously attained. According to Tucker, even though the images don’t definitively demonstrate that viruses act as seeds, they make that role more plausible than ever before. What’s new in the images are objects that look like viruses caked with calcium or magnesium minerals, he explained. That’s understandable, he added, given that viruses have a tendency to acquire a slight negative charge, whereas calcium and magnesium atoms in the EPS tend to lose electrons and become positively charged cations. Electrostatic attraction draws the particles together, resulting in viruses encrusted with calcium or magnesium ions. Once viruses become thus permineralized, Tucker said, they can seed the growth of the calcite and dolomite constituents of microbialites. 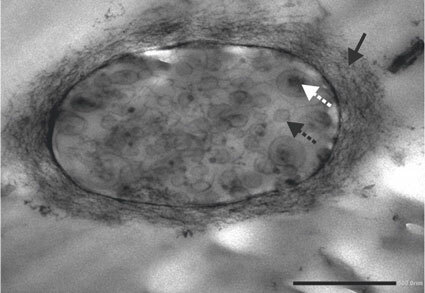 The unicellular bacterium in this transmission electron microscopy image from a sample of the microbial mat contains many nanospheres—some unmineralized (dashed black arrow) and others mineralized to varying degrees (dashed white arrow)—that the researchers propose are viruses. The black arrow in the top right points to threadlike extracellular polymeric substances encasing the bacterium. The black scale bar in the bottom right shows 500 nanometers. Credit: E. Perri et al. (2017), doi:10.1111/sed.12419, Figure 18b. © 2017 The Authors. Sedimentology, © 2017 International Association of Sedimentologists. Published by Wiley. This idea was first put forward in 2014 in a paper by Muriel Pacton, then of the University of Lyon, France, who proposed that the mineralized “nanospheres” she and others were observing in microbial mats weren’t very small bacteria, as many researchers had assumed, but viruses. Tucker’s team captured images with both a scanning electron microscope and a transmission electron microscope (TEM). The TEM is at the University of Calabria in Italy and is normally used by team member Ida Perrotta to study the growth of minerals in a completely unrelated environment: the arteries of humans suffering from atherosclerosis. “She is coming from a different direction, using medical techniques to see the viruses in our mat samples. Images like these have not been presented in the Earth science literature,” according to Tucker. Perrotta’s images show more detail than Pacton’s did, revealing that many of the mysterious nanospheres scattered among the bacteria in the EPS aren’t exactly spherical but have facets, suggesting they are actually icosahedral, the soccer ball shape of many viruses. Also, in some images many of these nanospheres are seen to be attached to the walls of bacteria, as if caught in the act of infecting them. “That’s a first,” Tucker said. In this scanning electron microscopy–backscattered electron microscopy image from the top layer of a microbial mat, small virus-like particles are seen attached to a bacterium, and others are clustered in the background. The researchers argue these are actual viruses on the basis of their nonspherical shape and that they play a major role in the mineralization of microbial mats. The bottom banner shows a 500-nanometer scale bar (right). Credit: E. Perri et al. (2017), doi:10.1111/sed.12419, Figure 17b. © 2017 The Authors. Sedimentology, © 2017 International Association of Sedimentologists. Published by Wiley. To determine more conclusively whether mineralized viruses initiate the growth of calcite and dolomite crystals, Tucker is now planning to analyze large crystals in today’s Mesaieed sabkha in search of chemicals that are unique to the viruses inhabiting it. Then he’ll seek out the same chemicals in ancient microbialites. Because the species of bacteria in microbial mats haven’t changed much in the course of evolution, the same would be true, presumably, for the viruses that infected them—if infected they actually were—when they first appeared on Earth, Tucker said. If this quest pans out, he added, it might help answer the question of whether viruses were already present and preying on other microbes back when microbial mats were new. Citation: den Hond, B. (2018), Images suggest a viral role in some rock formation, Eos, 99, https://doi.org/10.1029/2018EO095575. Published on 26 March 2018.